Speedotron DM1604 LV Deluxe 3/CC Light System - The most affordable and reliable strobes on the market. Canon Speedlite 430 EXII - Less power, but still sufficient. This is the flash we use when needed! Canon Speedlite 580 EXII - Power plus speed. Canon 24-70mm f/2.8L - We find ourselves shooting with this puppy 99% of the time. Canon 50mm f/1.8 - Dubbed the "nifty fifty" because it's so affordable. This is a fast prime lens that offers nice bokeh. Canon 5D Mark II - Our go-to full-frame camera. Canon 60D - A great cropped-frame starter camera. 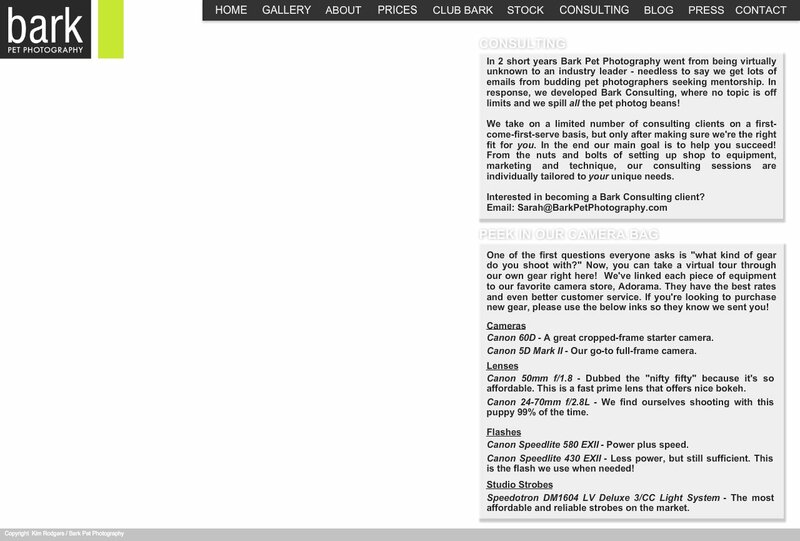 In 2 short years Bark Pet Photography went from being virtually unknown to an industry leader - needless to say we get lots of emails from budding pet photographers seeking mentorship. In response, we developed Bark Consulting, where no topic is off limits and we spill all the pet photog beans! We take on a limited number of consulting clients on a first-come-first-serve basis, but only after making sure we're the right fit for you. In the end our main goal is to help you succeed! From the nuts and bolts of setting up shop to equipment, marketing and technique, our consulting sessions are individually tailored to your unique needs. Interested in becoming a Bark Consulting client? One of the first questions everyone asks is "what kind of gear do you shoot with?" Now, you can take a virtual tour through our own gear right here! We've linked each piece of equipment to our favorite camera store, Adorama. They have the best rates and even better customer service. If you're looking to purchase new gear, please use the below inks so they know we sent you!